Last night, for the first time since she was born, Evie didn't get a formula feed overnight, and she didn't even get water overnight (for hydration). She slept like a typical child in her crib, with no hookups. I didn't have to hook up the 24" right-angle Y-port extension tube into her tummy and through a hole in her Zipadee Zip to the G-tube pump. 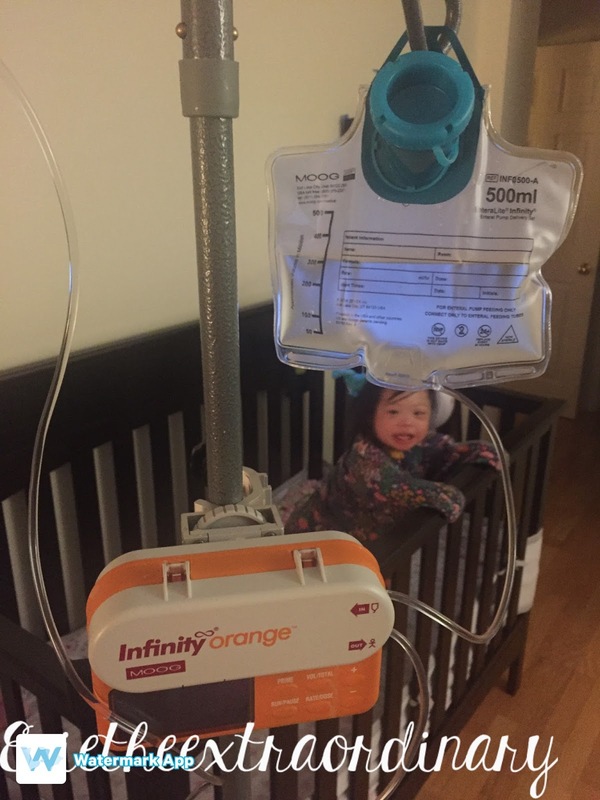 My husband didn't have to prep the 500 ml feeding bag and wait until she was asleep to hook up the feeding tube. He didn't have to wake up at 5 am to turn off the g-tube pump when the alarm said the feed was done. We didn't have to wake up because the flow was interrupted by her tossing and turning and the alarm didn't have to go off. SHE didn't have to wake up soaking wet because there was a leak, or because the tube somehow became disconnected overnight. With that, I want to post a tribute to the IV pole. It has faithfully stayed by her bed, standing guard and holding her food for 2 and a half years. It has alerted us with rolling sounds when she wakes up and starts moving around in the middle of the night. 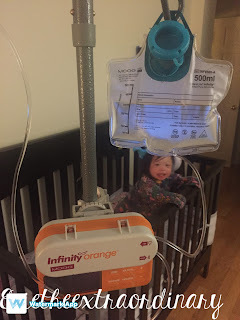 It has now become an interesting toy to Evie, which is another signal that it is time for the IV pole to be relegated to a dark corner, until she gets her next cold and we stand in front of it, considering whether or not we need it because she won't eat. But, Mr. IV pole, we are so done with you! I am ready to put my daughter to bed by just changing her diaper and zipping her up in her sleep sack, kissing her, saying our prayers, and putting her in the crib. The only thing left is venting her tummy before bedtime, but she just gave me the biggest burp in my face last night, so it's only a matter of time until we stop that too. Thank you, God, for all the cool medical skills I learned, but thank you even more that we are moving towards getting rid of it! So when can Evie get rid of it, you ask? Well, when she feels like eating enough to continue up the growth curve. Right now, she's getting 1 full Pediasure bottle a day to supplement, so we are close! Thanks for your prayers and for cheering with us! Oh, my goodness! This stage of life has been so exhausting for you. I know you don't resent the work because of your love for your child, but praise God for the light He has given you at the end of this long tunnel. Evie is in great hands. She will thrive because of your love and care and attention to detail. She will learn patience and compassion from seeing you act that out. She will learn about God's love and forgiving grace through your sacrifices. You are building a legacy with her each time you get up in the night, each time you care for her medical needs, and each time you make sure she's doing what she needs to do. You are doing such a great job! Thank you so much, Susan! I appreciate your encouragement! I have a question for you. My grandson has a g-tube. He is two. Right now we use a type of netting? Used in hospitals for burn victims to cove his g-tube mostly so he doesn't play with it. Do you have a better solution? I was thinking of sewing some kind of band to go around his stomach, not sure what would be a good material. Hi Momma Ski, if you search for "g-tube" in etsy.com, there are a lot of selections for bands to go around the stomach. I would say to look at those and see what kinds of materials people use. There are fabric ones as well as sturdier ones that have openings for access! Thanks for reading!